Crime, Opinion, Politics, Religion, U.S.
After carefully reading your letter I must deny your request in the removal of our Nation’s motto from our patrol units, and ask that you and the Freedom From Religion Foundation go fly a kite. Obviously the people that were upset with the decals aren’t going to be very happy when they read his response. 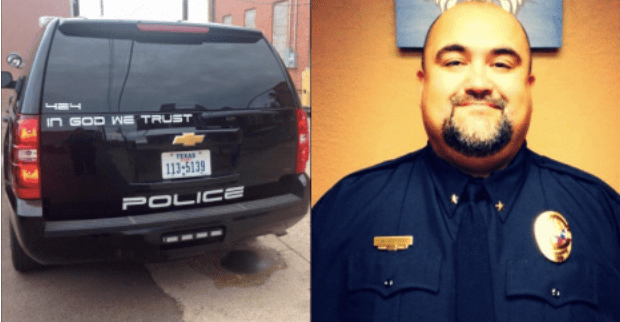 According to Chief Garcia, the decals have been backed with an overwhelming support with the community backing him as well. Atheist organizations like this one are known for trying to start fights. However, it is clear that most Americans have had enough with them picking fights. The Freedom From Religion Foundation may have thought they could easily have the decals taken down, but that was before the entire community starting backing him. With the community supporting him, does the atheist organization have any power and if so, how much. It doesn’t seem fair that one organization can choose what is best for the community. The police chief did what he thought was good and just and for that, he is supported. It might not even be support for the phrase but support for him as a person and leader in the community standing up against oppression. The common phrase is also on the U.S. dollar bill, yet they don’t protest money and avoid using it. What’s the difference?